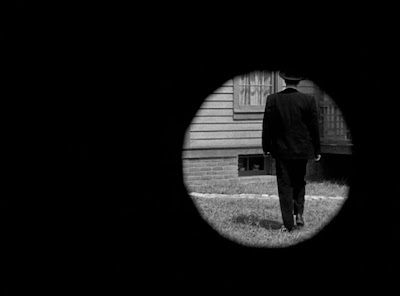 The Horror Digest: The Night of the Hunter: Bob Mitchum, Your Friendly Neighborhood Stalker. 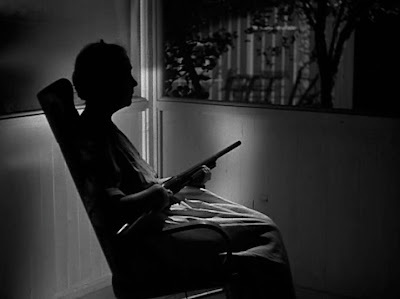 The Night of the Hunter: Bob Mitchum, Your Friendly Neighborhood Stalker. It's funny how the movies that I put off for last on my Scariest Movie Moments list, are really the ones that are surprising me the most. 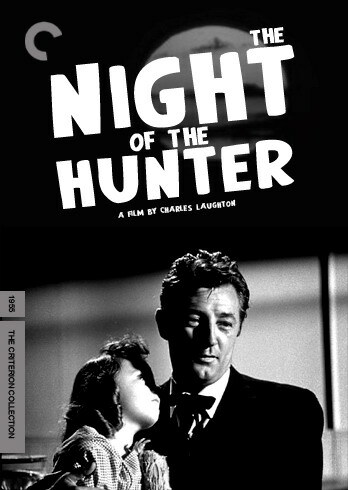 While I hadn't heard a lot about The Night of the Hunter, I did know that it involved a chase and pursuit with Robert Mitchum in the driver's seat. Although Cape Fear came after The Night of the Hunter, I was still a bit dubious that we would have another Bob Mitchum makes us feel creepy moment on our hands. Bob Mitchum made me feel creepy sure--but the real heart of the matter comes with the quieter moments. 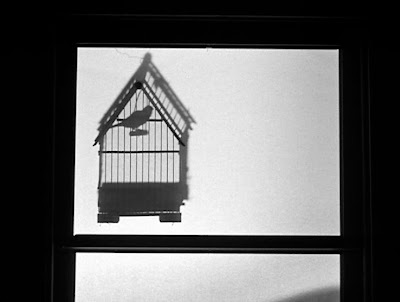 There are moments of fear so strangely haunting and strikingly beautiful and odd, that it seems like the film came straight out of the German Expressionism era--think The Cabinet of Dr. Caligari and even Nosferatu. Shadows and odd angles galore--I even tweeted that I had trouble capturing all the images that struck me- because there were just too darn many. After their father Ben is sentenced to hang for robbing a bank and killing two men, John and Pearl are left with their mother and a doll that's hiding their father's stolen money. 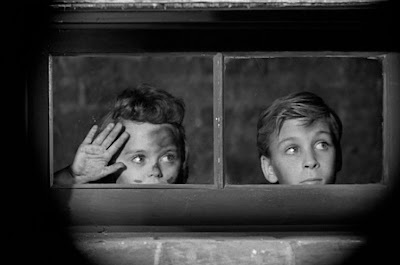 While in prison, Ben is bunked up with bogus preacher Harry Powell who learns of the money and tries to weasel the hiding place out of his bunk mate. 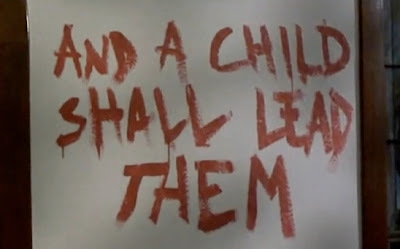 Ben leaves him with the Bible verse "And a little child shall lead them" (which you may remember from everyone's favorite flawed horror movies). Powell ventures off after his release to find Ben's family, marry his wife and get the kids to spill the beans. John catches on rather quickly to Powell's intentions while other's get caught up in his boisterous preaching. It becomes up to John to protect his father's secret and to protect his younger sister's life as well. As I said before, the real star of the movie is the cinematography and the absolutely breathtaking shots. It's almost a surprising element of the film- as at first I figured we'd be settled in to watch an hour and 30 mins of Bible verses and your standard Bob Mitchum with his wonky accent and stalkerish vibes. And then all of a sudden you are a shown a shot that just wakes you up. Little touches like, Robert Mitchum singing hymns and calling out for the children- while the camera does this fantastic shot that zooms right in on just where the children are hiding. 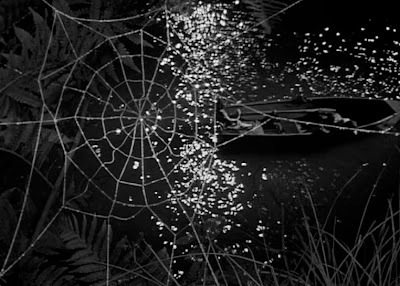 Then there is perhaps the greatest moment of subtle eerie-ness that I have seen. 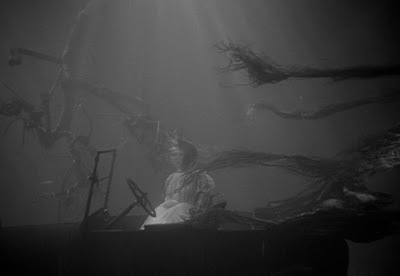 The shot of Shellie Winters' character dead in the bottom of the lake tied to a car. I looked away for a minute then clicked back on the film screen and my eyes practically popped out of my head. 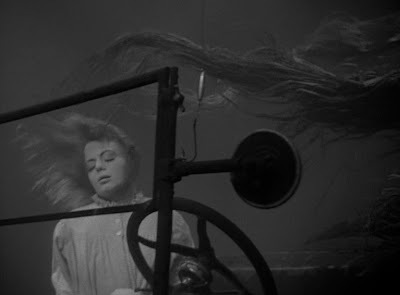 There's this fantastic kind of whistling music , and seeing her hair like that and also just being terrified that that is what happened to her is completely mind blowing. It's the perfect example of kind of quiet horror that I'm referring to. Then there is of course just the element of complete and utter astonishment at Robert Mitchum's scary preaching, and his solo talks with God. Add in the hysterical lynch mob at the end, the constant singing of hymns and the quickness with which Bob Mitchum is able to make his move on the family- and you have a full hour and half of sheer terror. I cannot tell you how madly in love with Rachel Cooper I was, or how pleased I was to see things come full circle from the opening scene to the closing one. Just know that this film completely took me by surprise. 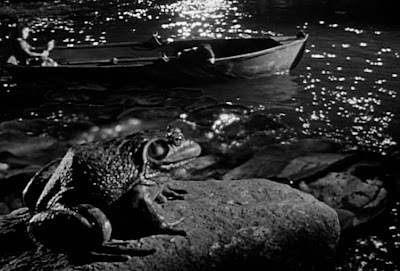 For those of us that can appreciate a classic and beautiful black and white film- look no further. Heck, even if you have seen it, watch it again and bathe in it's glory. To remind you of this fact, or to spark your interest here are some of those fantastic screen grabs I was blabbing about. We actually saw this movie in my film class. Good movie. A lot of people laughed when Mitchum went batshit and laughed... although this film was beautifully lit and photographed. Such a great movie...I've never been able to get the image of the mom dead in the car at the bottom of the lake out of my mind. Need to see it again! Oh, and of course, Robert Mitchum-magnificent! One of my all time favorites. Robert Mitchum's preacher character is one of the best villain roles in cinematic history. "Children... oh children!" Yeah, this is one of the greats you can't ever shake. It's the kind of horror film too few horror fans know about. this sounds like an intriguing film, I must check it out! One of the all time greats and for my money one of the more detestable villains in horror. And Rachel Cooper's face-off with Harry Powell was terrific.